…to enhance any yard, but planting roses takes it to the next level. Roses are steeped in tradition, and they provide a sense of nostalgia for many people. In the past, planting a rose garden meant following a formal pattern and strict color schemes. Today, landscaping has taken on a different tone. By following a few basic guidelines, you can turn your rose garden into a unique work of art. Dedicating a location for your rose garden is key and should be decided upon before you choose your plants. It’s a good idea to draw a map of your yard and choose several areas of interest. Spend some time in your backyard at different points of the day. This will help you determine which spots get the most sun and which areas are most easily viewed. When it comes to designing a rose garden, aesthetics play as much of a role as the aromatic scents the flowers provide. You should always consider the amount of sun your rose garden will get. Roses thrive on sunshine and need at least six hours of it each day. Some varieties do not need as much, but more doesn’t hurt. The best time of day for your roses to soak up the sun is in the morning or early afternoon. In certain locations, you may also need to factor in the sun’s movement as the spring and summer months pass. While roses generally adapt to most soils easily, you should still choose the most fertile areas to do your planting. These delicate blossoms do best in organic matter such as manure or compost. Avoid using soil that is highly acidic or has a high alkaline level. You can balance out the soil by adding lime or sulphur. Most varieties of roses do well in soil that has a pH level of approximately 6.5. Before you pick your flowers, make sure the garden area has decent drainage. If the soil stays damp throughout the day, add drainage tiles. For areas that drain too easily, add organic matter such as wood chips, peat or straw. In colder climates, excessive wind can cause damage to roses and the soil they are planted in. You can offset the damage by constructing a windbreak around your garden. Many people prefer to grow only roses in their rose gardens. However, contemporary gardening allows for a more eclectic display. Keep in mind that the plants or other features you use in your rose garden should complement the roses and not overpower them. Avoid using plants that can damage your blossoms. 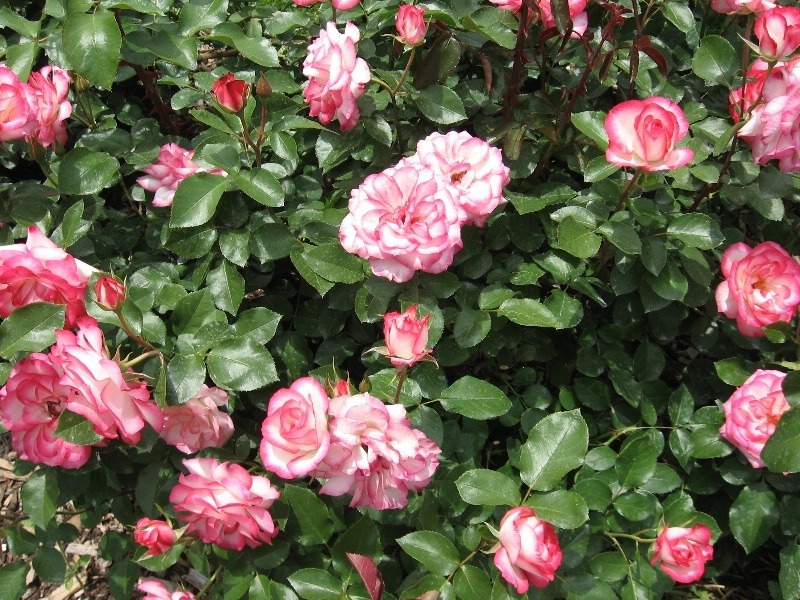 The roots of large shrubs or trees can inhibit root growth in roses. Leave enough distance between each type of plant you use in your rose garden. This includes all rose varieties. Some roses are more temperamental than others. To be safe, it’s best to treat each variety as if it is from a unique class. When arranging other types of foliage in your garden, keep taller plants in the center or at the back. The roses will be the focal point whether they are placed upfront or used as bookends for the garden. Once you select a location, begin shopping for the flowers. Whether or not you stick to a certain color scheme depends on your personal preference. Some people opt for one or two shades that harmonize well together such as pale pink and yellow or varying shades of red. If you favor multiple colors over one or two, scatter the rosebushes around instead of clumping each color in one area. You can use an arbor as a centerpiece or backdrop for your garden, or you can lay the roses out in symmetrical patterns. Smaller blossoms should be placed at the front, and larger ones should outline the sides of the garden. To really make the plot stand out, border it with paving stones, or place a small fountain at the side. Plant smaller coordinating flowers around the fountain to tie in the colors of your roses. Your rose garden can be a formal, elaborate, symmetrical display or a flowing, unfussy, eye-catching creation. No matter how you choose to present your fragrant blossoms, it’s important to take pride in your work. Install It Direct can provide more tips on developing an impressive rose garden. Join our email list or sign up for a free estimate, and you will soon be enjoying the beauty of a perfectly crafted rose garden.